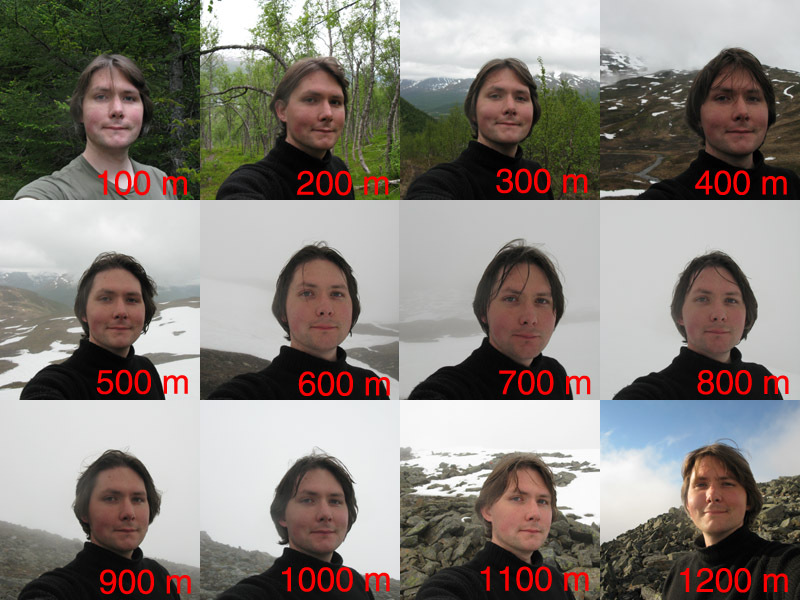 On July 1st the weather in Tromsø was grey and overcast. Hanneke and her colleague Trond were sitting in the meteorological office looking at a satellite image showing the sea of clouds when they noticed one dark pixel. That pixel was the top of Tromsdalstinden poking through the clouds. 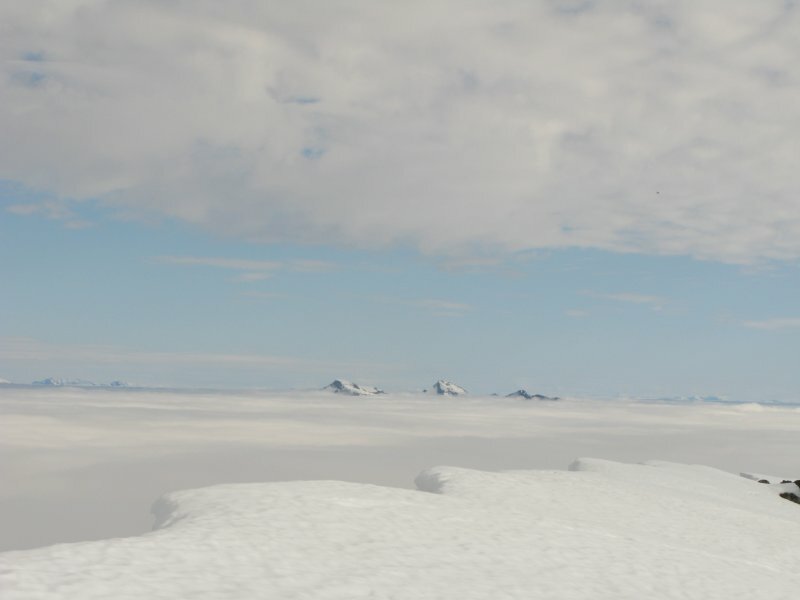 Almost since arriving in Tromsø I have dreamed about standing above the clouds on top of Tinden, but without a private meteorologist it was a difficult dream to realise. From Tromsø I could never see whether the top was above the cloud or just in the cloud. Today was my chance! So based on a single pixel I threw on some clothes, drove to the bottom of the mountain (instead of the office) and started climbing towards a layer of thick cloud and zero visibility. Hanneke and Trond thought the conditions might only last for a few hours, so I was against the clock. I left without breakfast and without charging the batteries for my GPS. A fist full of mars bars and a compass would have to do. I headed to the top as fast as I could, but above 500 m I was hindered by a lot by deep snow which was still on the ground. I thought I could walk around the few patches that remained in July, but they were much bigger than I thought. Trudging through snow in the cloud was not much fun. I began to worry that it would be in vain. 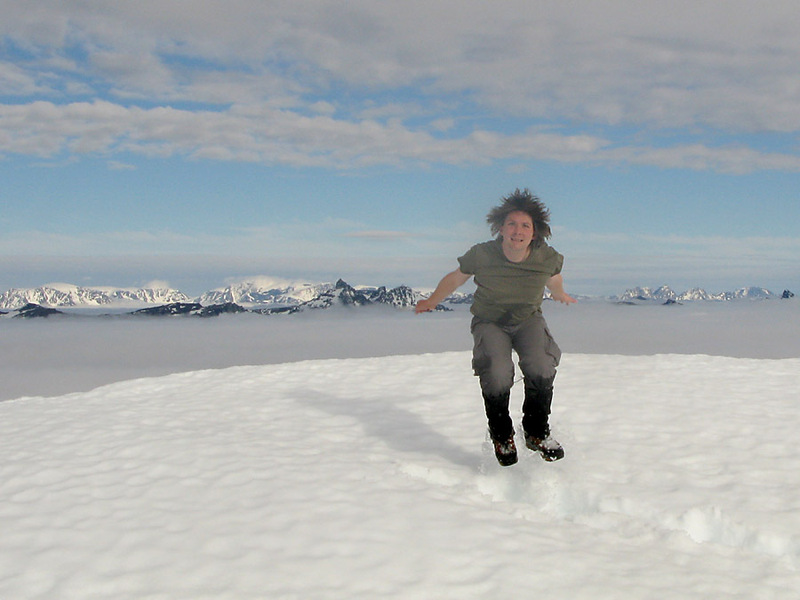 I hoped I hadn’t taken a day off just to wander around on my own in a cloud! At 1000 m I was beginning to lose faith in the pixel, when I noticed a strange phenomenon. Here in the mist, rocks felt really warm to the touch. They must have seen some sun not long ago!! I stepped up the pace, and a patch of blue sky began to emerge through the mist. 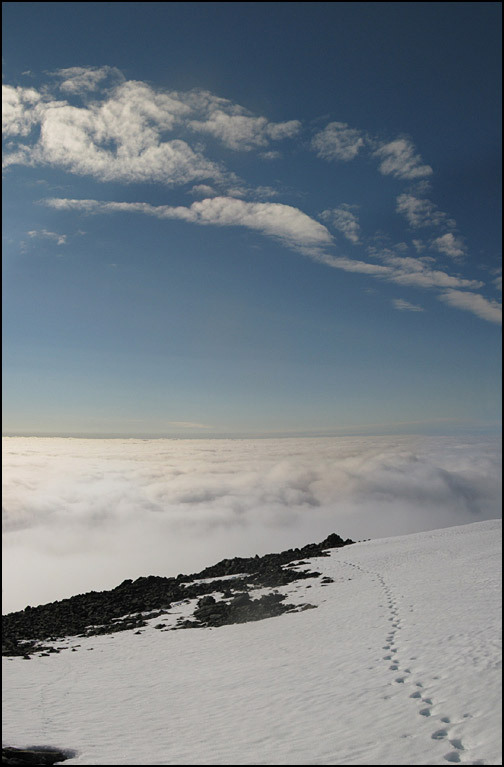 The cloud top was very well defined when I crossed it – within a few steps the visibility went from zero to almost infinite! It was like putting my head above the surface of a swimming pool. 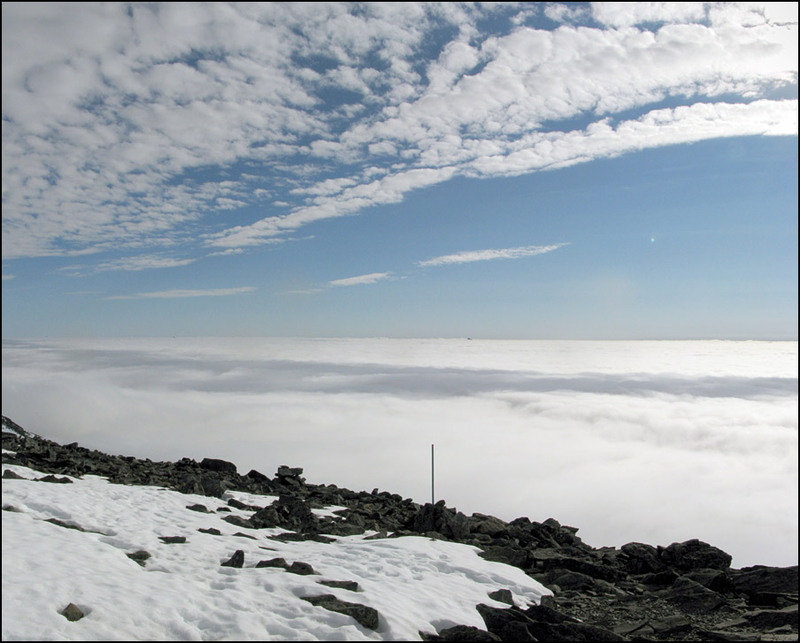 The pictures below show the view from the top, about 100 m above the clouds. The peaks in the distance are the Lyngen Alps. I spent more than two hours on the top enjoying the sunshine in a t-shirt. 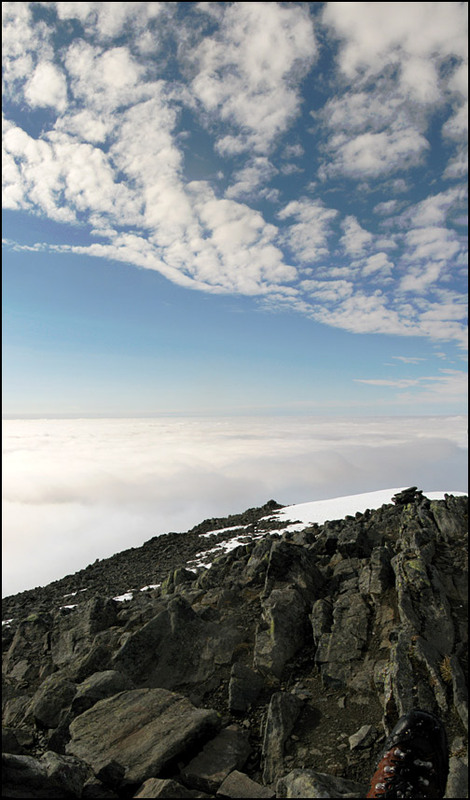 While on the top, I took this time-lapse video of the clouds sweeping past Tromsdalstinden. It was almost like standing on a ship and watching the waves roll past. Just before I left another person emerged from the cloud below – he turned out to be a pilot who had seen the peak sticking out before landing in Tromsø. He had literally run up there afterwards! Another pilot promised to try and take a photo of him on the summit. 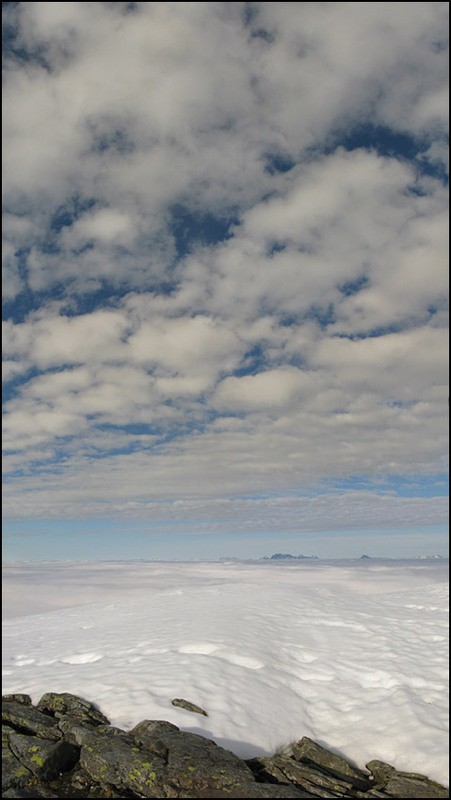 That would have been a cool picture – but just before the plane was due to take off, the cloud level rose, and we were surrounded by the whiteness again! Nevermind – we were content in the knowledge that we had stolen ourselves an extra day of sun! what a nice experience must that have been for you!And especially the video is very nice!Every week I’m looking forward for some new adventures from you both! Many greetings to all, Els. WOW! What a day to remember. What a unique marvelous experience. What a luxury to have your own personal meteorologist! Love your pics. The one of you jumping is a prize winner! The video takes the viewer to be right there. Thanks for sharing. Thank you both for sharing this amazing moments. 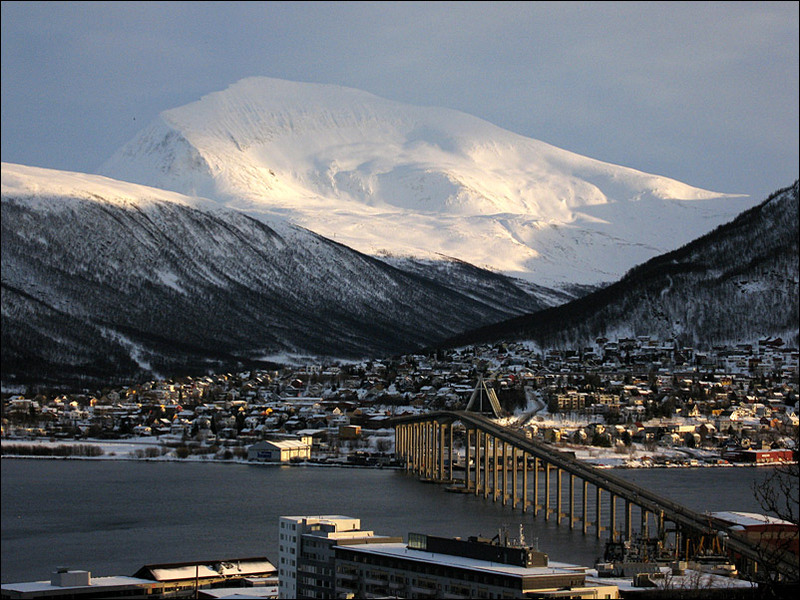 It gives me need and hope to visit Tromso once more. More seriously this time. Thanks for your comment, it’s always good to know that people enjoy what we write!